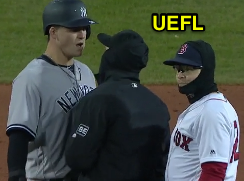 HP Umpire Hunter Wendelstedt ejected Red Sox pitcher Joe Kelly (throwing at), Yankees DH Tyler Austin (fighting/charging mound), 3B Coach Phil Nevin, and P Tommy Kahnle (fighting/bench clearing brawl; QOCU) in the top of the 7th inning of the Yankees-Red Sox game. With one out and none on, Austin took a 2-1 fastball from Kelly for a hit-by-pitch. Replays indicate the 97.7-mph pitch was located inside, the second inside fastball of the at bat, and struck Austin on the left arm, prompting Austin to charge the mound and the benches to clear following a prior bench clearing incident in the 3rd inning as the result of an Austin slide into second base (and unsuccessful slide rule interference challenge by Boston Manager Alex Cora), the call was irrecusable. At the time of the ejections, the Yankees were leading, 10-6. The Yankees ultimately won the contest, 10-7. These are Hunter Wendelstedt (21)'s first, second, third, and fourth ejections of 2018. Hunter Wendelstedt now has 9 points in the UEFL Standings (1 Prev + 4*[2 MLB + 0 QOCU] = 9). Crew Chief Larry Vanover now has 7 points in Crew Division (3 Previous + 4 Irrecusable Call = 7). These are the 17th, 18th, 19th, and 20th ejections of the 2018 MLB regular season and 6-9th of the day. These are the 11th, 12th, and 13th player ejections of 2018, and sixth through eighth of the day. Prior to ejection, Austin was 1-2 (RBI, SO) in the contest and Kelly's line was 0.1 IP, HBP. 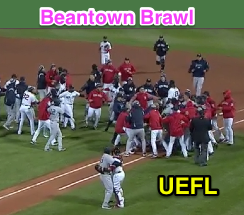 This is Boston's 1st ejection of 2018, 2nd in the AL East (NYY 3; BOS 1; BAL, TB, TOR 0). This is New York's 1/2/3rd ejection of 2018, 1st in the AL East (NYY 3; BOS 1; BAL, TB, TOR 0). This is Joe Kelly's first career MLB ejection. This is Tyler Austin's first career MLB ejection. This is Phil Nevin's first ejection since September 11, 2005 (Gary Darling; QOC = U [Balls/Strikes]). This is Tommy Kahnle's first ejection since August 24, 2017 (Carlos Torres; QOC = U [Throwing At]). This is Hunter Wendelstedt's first ejection since June 28, 2017 (Jake Petricka; QOC = Y [Balls/Strikes]).